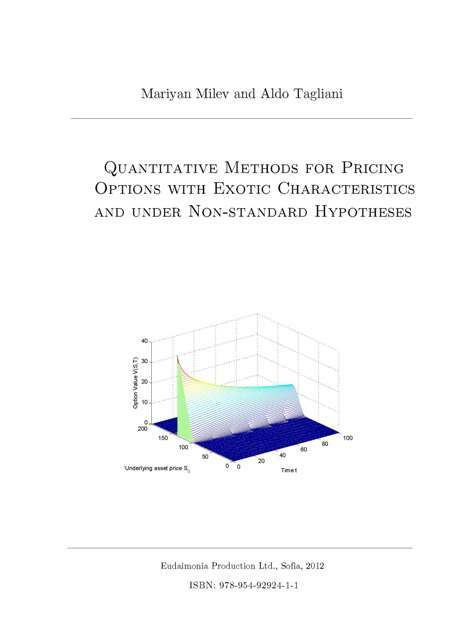 Pricing Options with Exotic Characteristics and under Non-standard Hypotheses’, 2012.
нестандартни хипотези), Eudaimonia Production Ltd., Sofia, ISBN: 978-954-92924-1-1. Математика, Физика и Природни науки” в „Университет Тренто”, Италия. „Стопански Факултет”, „Университет по Хранителни Технологии – Пловдив”. математиката или невронни мрежи в информатиката уравнение на Блак-Шолс. финансовите активи, но възможността за поява на неочаквани скокове. Ирански технологичен университет, както и с други учени от Европа, Азия и Америка. мл. от „Университет за Национално и Световно Стопанство” – София. Zentralblatt, Math, Elsevier, Scirus и MathSciNet на American Mathematical Society. This book is aimed at a reader who has basic knowledges in disciplines like linear algebra, numerical methods, probability and statistics, but does not know how to use them together to solve problems considered in Quantitative Finance such as the option valuation problem, i.e. to be defined a fair value of the option’s price. For this aim, in this book we present basic definitions of different types of options as well as numerical methods for their evaluation known also as Quantitative methods for pricing options, hence the title of this book. This book is organized in nine chapters, including a detailed introduction and a conclusion chapter. There is also a short abstract and three appendices dedicated to an implementation of the presented quantitative methods in Matlab and an external discussion of them as well as some additional topics such as classification of M-matrices. We do not attempt to describe all kinds of Quantitative methods but instead to examine a few of them in depth with the objectives to illustrate certain ideas for pricing options. The book is appropriate for undergraduate and doctoral students, studying applied mathematics or graduate course in business, economics, and financial engineering. We strongly recommend the first three chapters to students in the undergraduate course of Economics and Finance or in postgraduate course of Mathematical Finance and Derivative Markets. The book is also useful for practitioners and curious people who want to acquire a working knowledge how financial derivatives can be analyzed.